Looks like rain. Fancy a quick one down the local.' This I have come to learn is English for meeting one's friends at a bar for a drink. Delightful pic! It could so easily set the scene for a story! great shot! love the slow-mo in this photo. 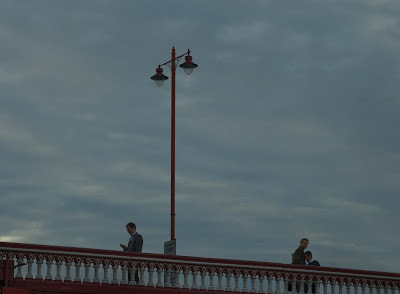 I think the people on the bridge adds a new dimension to the scene and I like it. 6 p.m. is a nice time to take photos or so I have found...if I can just get out and about then. I like the people in the photo. Rain in London, sounds like a great reason to visit a bar. Like that I learned some new English too,lol. I recognise that saying very well. It'll all end in beers you know. Again I like the way the people are opposed like bookends, the lampost is dead straight and that light is exactly what you get in London. Glad you are up and running again. Fabulous shot all round. I like the sky, but you've done a really great job adding interesting with the railing and light pole. Haha, down the local is a new one for me. My personal favorite is "up the doctor". A similar sky has been hanging over Toronto all day and looks here to stay through the weekend if the forecasts hold. Bah! Thanks for stopping by. It looks like you're enjoying London. And yes that definitely looks like rain. I'll come back after Ike blows through and take a tour of your idea of London. I love this with the street lamp and I love the lingo explanation! I'll fancy one with you!